Whether you want to stay on the Left Bank or the Right Bank, you’ll find an address to suit with one of our hotels. while our sister Hotel Scarlett is at the centre of an historic and eclectic district. And find us soon at our brand-new location in Ménilmontant. 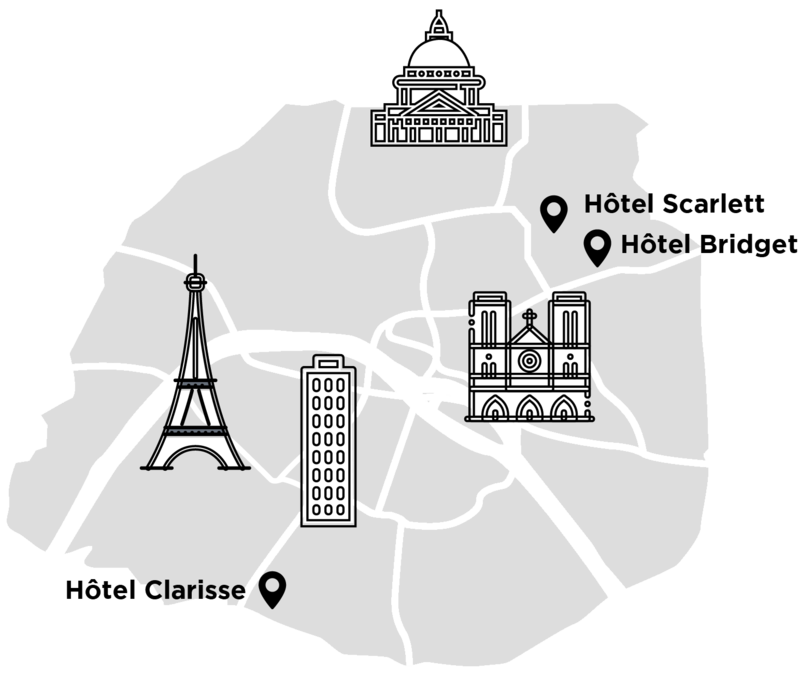 Our latest hotel, the Bridget, welcomes you on the Rue des Pyrénées in the 20th arrondissement, in a setting as warm and friendly as those of its sister hotels! We still have so much to experience together! The entire Clarisse team is also at your disposal to answer your questions and help you with your reservations for restaurants, excursions, museums... It would be our pleasure to advise if you're looking for outings or visits ideas! Our staff is at your service for your comfort and safety, 24/7.